Doug: Ever have an idea percolating in your brain for... forever? This is that. 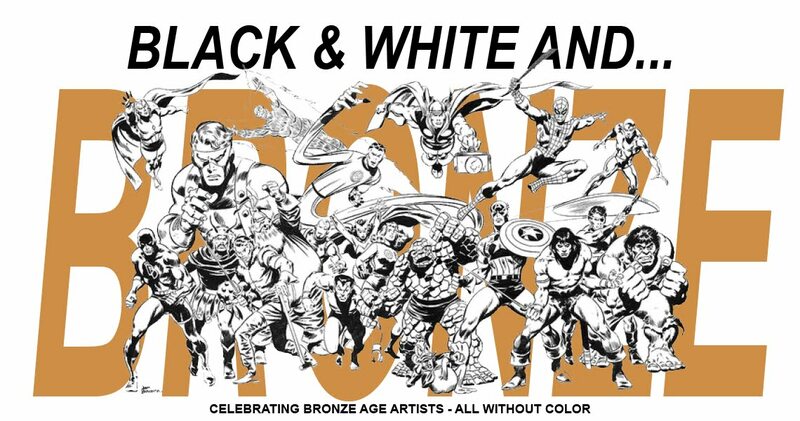 For many months I've been wanting to do something on the blog with one of the greatest aspects of the end of the Bronze Age and beyond. 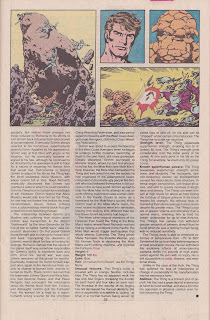 In the early-mid 1980s Marvel Comics published a periodical encyclopedia called The Official Handbook of the Marvel Universe; the Distinguished Competition's entry in the genre was the equally entertaining Who's Who in the DC Universe. There is a nearly bottomless mine of good stuff for us to discuss, so we'll see if today's inaugural foray gets any kind of commenter love. And I don't want to hog this idea -- if anyone reading wants to submit a post in this vein, by all means email us. Doug: Obviously there are many more points of interest in the Thing's biography. 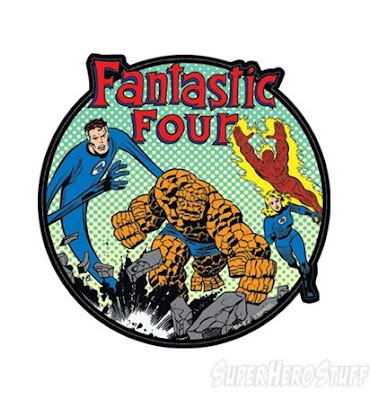 But today let's center on the man's scale, particularly as compared to his fellow denizens of the Marvel Universe. How's that stature? Too small for you? 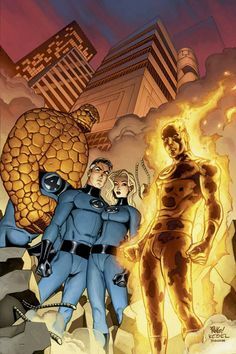 In the Fantastic Four films of a few years ago, featuring Michael Chiklis made up as the Thing, Ben was no taller than his male teammates. But then, what of some of the latter samples I posted -- too large? In the FF film from last year, the CGI Thing seemed more in line with the art above. That being said, I suppose Ben would still be in scale with the Hulk, as ol' Jade Jaws is now never depicted on film as shorter than 10 feet (or so it seems). Have at it, and thanks in advance for your thoughts. Great inaugural post Doug; there is a ton to cover along these lines. I like the idea of the Thing being more human size; I can see him being a little taller like 6'6" but not taller than that. My reasons are more practical to his story and inner challenge that he was human and still leads a human life despite being a "monster". 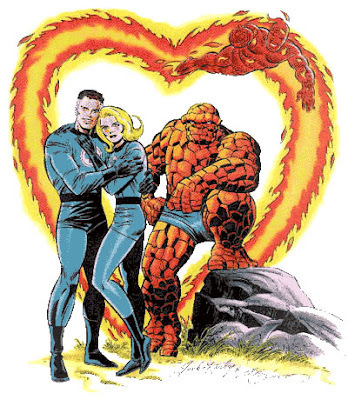 Some of my favorite scenes with the Thing are of him living in the Baxter building, making pancakes for breakfast, playing cards, dating Alicia,etc. I'm sure it can work with him being huge, but for me it takes away some shorthand for his humanity. This is just a guy covered in rocks. Without the rocks he may just be like your neighbor or brother-in-law and that is all he wants to be. Perhaps it doesn't make sense as I can see it being explained, but the height for me takes away some of that normalcy and makes him the huge powerhouse of the team. He is just another strong, godlike, physical force; it seems too much the focus. And at his lower height he can still be the underdog taking on bigger challenges. Just my thoughts. Interesting post, Doug! 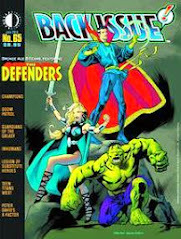 I've never read any of Marvel's or DC's handbook offerings, so I look forward to the exposure. At some point, Colin, we probably all wondered if that technology would allow normal folks to be bathed in cosmic rays. I know the thought crossed my mind! Thanks for the comments so far, gang. I am all for "artistic interpretation", but I think you've hit on an important notion. Part of Ben's appeal, indeed his very persona, is that underdog role in many a'battle. Drawing him as some hulking rocky goliath takes away some of the doubt in whether or not he can triumph. 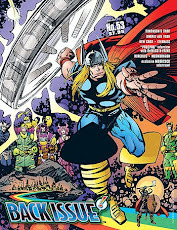 I remember with that 2nd volume of THOFTMU that cover artist John Byrne left Marvel about halfway through the run. . . which certainly put a hitch into the huge, panaromic, continued-at-both-sides cover concept they had goin'. One of Reed's arms just continues stretching along for months and months. IIRC, Kerry Gammill took over that assignment, and honestly did a credible job of keeping it going through to the end. Boy, I wonder if that "full" image was ever published or produced for us rabid fan-types? Ben's official 6' height has always seemed to be about 4" to 6" too short to me. But I very much like the fact that he can physically fit in (more or less) to the footprint of the conventional-bodied world. His editor-free upscaling in the "Bigger-Is-Awesomer,-Dude" 90's was as pointless as pretty much every other decision made at the time-- and it did indeed separate us from his inherent humanity. . . 'cause he was a physically monstrous behemoth. Which we didn't need at all--- PLENTY of characters out there delivering on the route already. I'm almost positive that the Hulk's "official" height in those splash-banners was 8' at one brief point (or it may have appeared elsewhere)-- but was quickly revised down to 7'. He, too, has always seemed just a touch bigger than 7' to me-- but again, 8' makes him so huge that even normal relationships (or a marriage to a queen, for pete's sake!) would seem to be problematic. 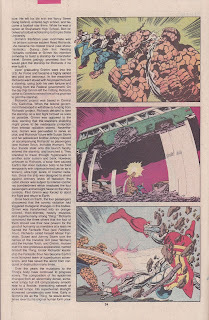 'Course, both Ben & the Hulk are fellas that do carry themselves "Big", albeit in different ways. Ben with his commanding, over-sized personality; Hulk with the energy of his easily-provoked rage. I love my partner's post today. This is a topic I've wondered about -the Hulk's ever-increasing size as well. I think HB touches on it - the modern need for bigger, and more bombastic everything now. You can't have one stick of dynamite explode, you have to have a ton of super-explosives go off. Today's audience expects exaggerated action and scale -hence the Fast and Furious films, where cars (and people) defy the laws of physics. Or The Hobbit movie, where you can't just have a Giant walk through a valley, you have to have the Hobbit and the Dwarves actually ride on a Giant's knee and get tossed hither and yon. It's like nobody knows how to do anything 'real' any more...I get more enjoyment out of the Roddy Piper-Keith David fight in 'They Live' than about any modern action sequence! That Roddy Piper and Keith David fight is epic. I enjoy it more every time i see it. The length of that fight is hilarious. I agree bigger is not always better. There has to be a reason behind it. As an aside, Roddy Piper would have made a great super villain. I always picture the Wrecker acting like Roddy Piper for some reason. Yelling everything. I always thought the Thing was drawn reasonably one-size from one artist to the next. 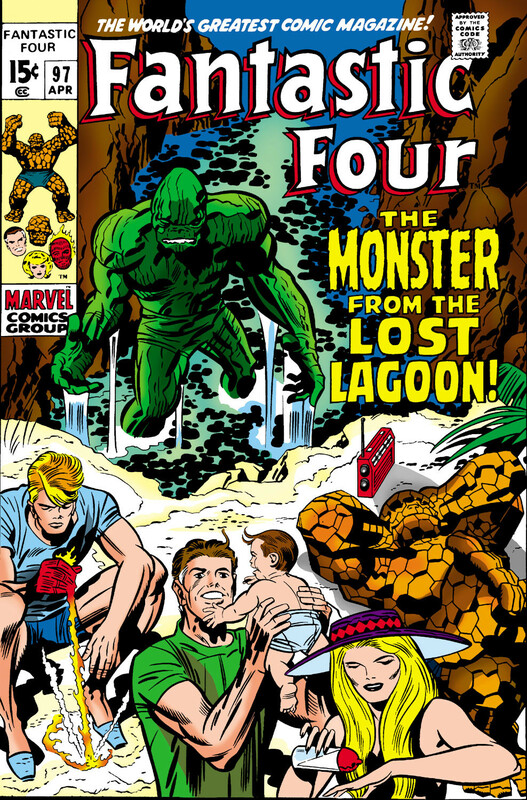 It interests me that you’re using the Hulk as a yardstick for the Thing, as the Hulk seemed to vary wildly from not-much-bigger-than-Ferrigno to absolutely massive. Kane’s Hulk in particular seemed super-wide as well as tall. Kirby drew him big. Ditko bigger still I think. When Sal Buscema drew Banner morphing into Hulk in a single panel, he seemed to get three times the size and at least 3 feet taller. I guess also there’s the question that the Hulk’s size rises in relation to his temper, so he doesn’t have to be a consistent size. Not to lower the tone, but you do also raise the question of the extreme variability of buxomness among the girls. 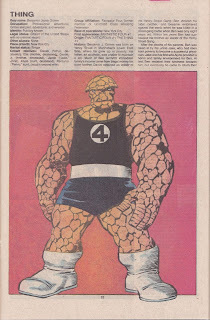 Everyone Byrne drew seemed to moved up a couple of cup sizes, while anybody Sal Buscema drew was shopping at the other end of the lingerie rack. It must have been murder on the girls, losing and gaining inches like that….no wonder Jan had to change costumes every five minutes ! I always thought Unca Benjy was a great character. He is supposed to be Kirby, by all accounts, isn’t he? 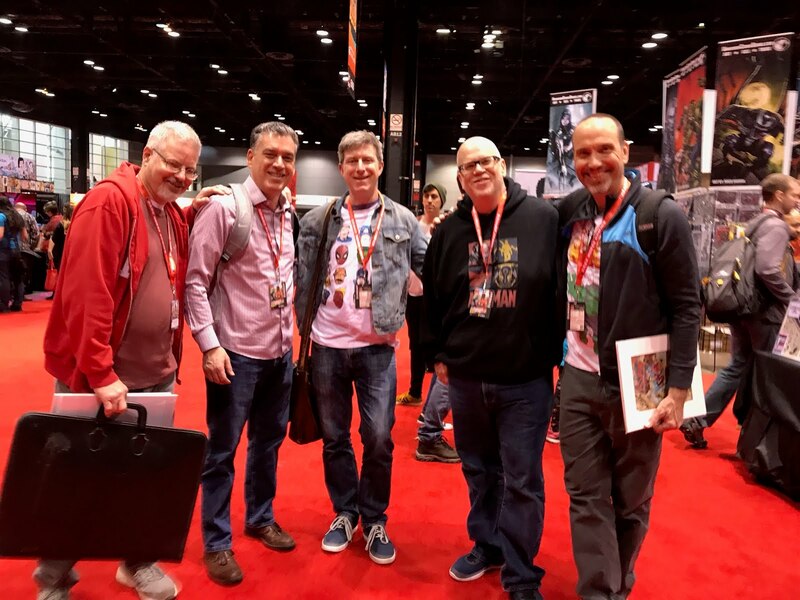 Maybe that’s another topic, KarenDoug….which creators can we see clearly in their creations? 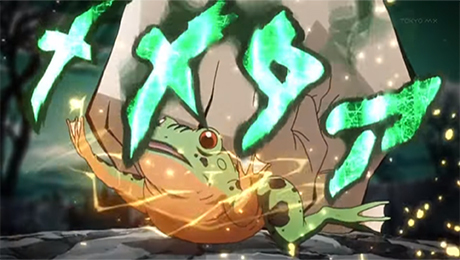 And conversely, which creations are surprisingly atypical given what we know about their creators. Ben Grimm is my all time favourite superhero. 6ft is perfect. Like others have said, it works great when he's up against foes like the Hulk. 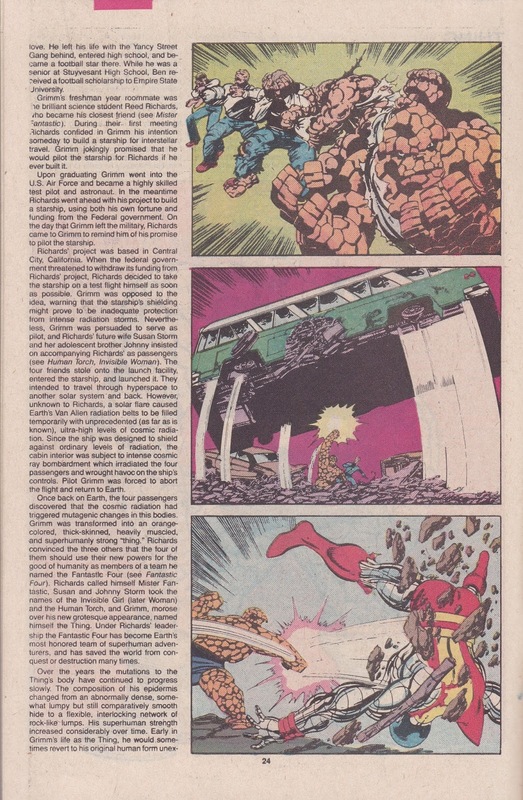 It even worked when he fought a half powered Thor in a FF issue (I can't remember the issue number, but it was a Lee/Kirby story, where Spider-Man, Daredevil and the said half powered Thor, teamed up against Ben, Johnny and Reed). Thor was taller than Ben in that adventure. And going off at a slight tangent.. I loved Michael Chiklis as Ben. Amen to your comments about movie bomast, Karen. I love action as much as anyone, but movie trailers consisting of a string of explosions and flying cars? No thanks, I'll pass. 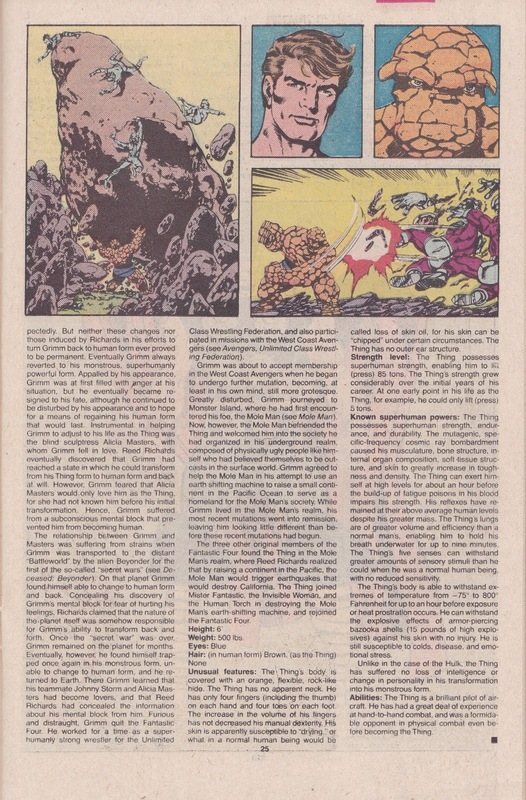 Give me character drama, give me tension, give me Ben Grimm muttering amongst a crowd in his (oversize, but not gigantic) overcoat and hat. 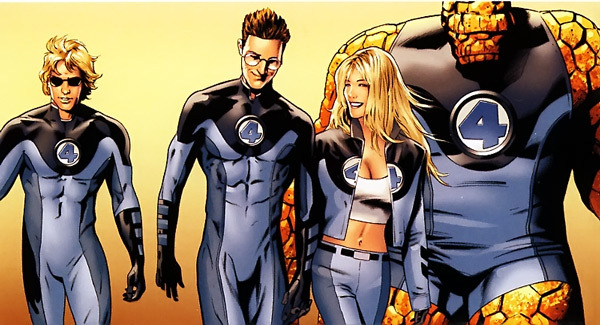 But Marvel's always played fast and loose with their "official" heights; plenty of comics have She-Hulk way too short, or Wolverine way too tall, or whoever. Most artists probably don't consult the Handbooks before drawing. As a general rule, I just go by what I consider to be the iconic version of the character. 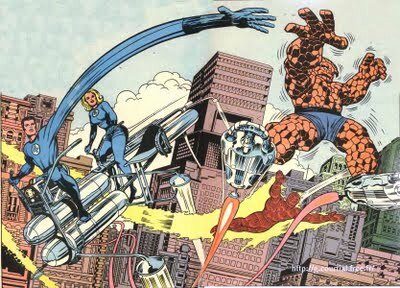 So, as far as I'm concerned, whatever height Jack Kirby drew the Thing, then that's how tall he's supposed to be. 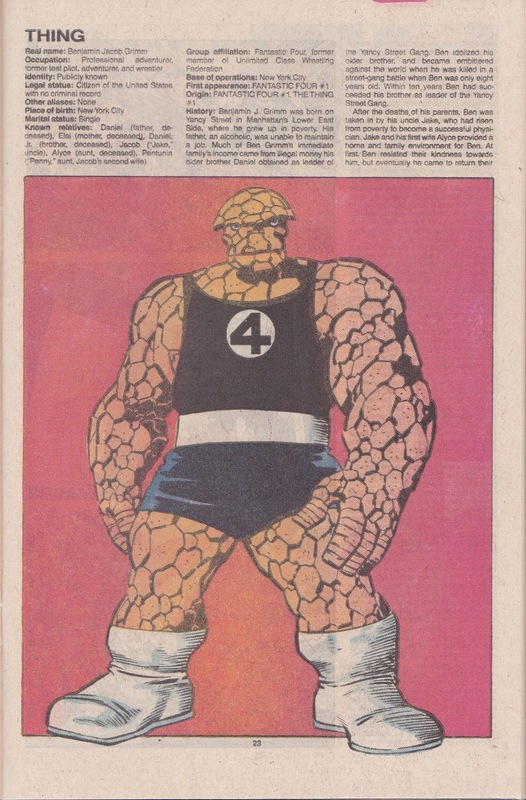 My other barometer for the Thing is John Byrne, and he drew him like Kirby did, at a normal height of about 6 feet as well, so that's good enough for me. The Handbook was right on, IMO. Yep, I think the bashful, ever-loving, blue-eyed idol of millions (any other nicknames in there I forgot?) looks best when drawn about average size, so the 6 ft. specified in the Handbook is about the absolute tallest he should be. Also, I love the idea of doing some posts on Handbook entries. I think it's come up before, but I had the first volume (from the early '80s) and remember totally loving it - and eating up all those statistics and miscellaneous facts. Looking forward to future posts. 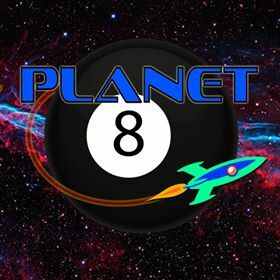 Great topic, looking forward to more Handbook-related posts here. I'm going to say he's a bit taller than most commenters. I'd say Ben is 6-1 or 6-2. The Official Handbook lists Captain America as 6-2, I'd say the Thing is at least as tall as Cap. Hmm well now I think Ben's height could fall anywhere between 6 feet or maybe a few winches taller, 6' 2" at the most, if he doesn't tower over other heroes. His width on the other hand is definitely up for debate. I prefer the Thing and the Hulk drawn as wide as possible, it's just my taste. What's crazy about the Hulk's height is that he's been scaled up from 7 feet all the way up to 15 feet in the 2003 Hulk movie, and even nowadays in the Avengers movies he's listed at 9 feet. Hugh Jackman is a 6 footer yet he portrays Wolverine who's supposed to be really short in the comics (his great performance is his saving grace). - Mike '5 ft 3 inches' from Trinidad & Tobago.